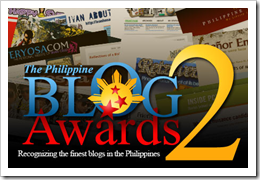 Ok I did not make it to the Philippine Blog Awards even though I am nominated for Best Technology Blog, The Main reason is , I am not in Philippines and it still need to wait 7 mos before my vacation. Anyway there are lot so of fellow bloggers that made their post and I am leading you to all those post. Well I took the list from Jezhlau. So here are the list including links to Tons of Pictures during the event. BTW Karlo won the Technology Category. Still, congrats Dex for being among the finalists! Yeeahhh.. I think it is.. And I hope they can make it during summer time.